Readers will remember I've never been completely convinced the October high is THE top in this market, though for a few months now it's been practically gospel that it is. 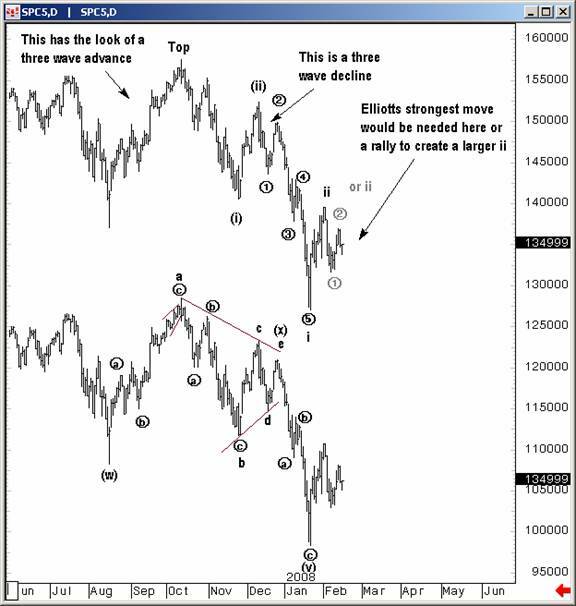 The market has yet to commit to one direction or the other, but the chart below shows the bullish and bearish cases and why unbiased Elliott wave analysis has to have at least serious doubts about the bear count. First, the move from the August low to the October high has the look of a three-wave advance, and impulses do not end in three-wave moves. Then, wave i of wave 3 in the bear case, starting on December 11 , also appears to be three-waves on a 60-minute timeframe, making an impulse down problematic. On the other hand, the bulls may have a perfect w-x-y correction complete from the October highs to the January lows, our 1256 target. We can even allow for another slight new low being made without invalidating the bull count, but, while bull count remains intact, my rally to new highs is a distinct possibility. Stocks reached an important juncture at the end of January and have been struggling to dictate the wave count ever since. The break of the large triangle from the summer '07 highs signaled a down turn in the market and actually foreshadowed the massive SocGen related selling in January. It's hard to blame anyone that shorted that hole, since it did resemble a real breakdown. But TTC did not fall for it – in fact, we bought the exact bottom and have been trading our proprietary targets ever since. We continue to see exponential growth in our membership, to the extent that we will probably be forced to close our doors to new members this year, precisely because we do not color our analysis with bias, or manipulate our counts to match our favored outcomes. Unfortunately, too much of the analysis community fails to live up to this basic standard and Elliott wave analysis has lost the prestige it once had as a result. Simply put, as an Elliott wave purist, it's impossible for me to ignore the faults in the bear case shown above. This unbiased view has allowed TTC members to respect the indecisive nature of the current environment and participate on both sides of the market. Looking ahead my view against the bear case is corroborated by extremely bearish sentiment on the Street, which would tend to prevent huge declines, and the DJ Transports, which have now rallied off of a three-wave decline, suggesting impulsiveness to the upside. But I'm not suddenly now going to rest on my laurels or marry a particular outlook. Next week we'll be looking for the market to verify our analysis early in the week with a Tuesday or Wednesday rally, or else we continue to slide sideways or down. Seeing this week close near our 1352 target makes that work even easier next week: either we gap above or trade above that level to confirm a more long term bullish outlook or we don't. Getting below 1308 would begin to raise serious questions about current count, but even if the market does move lower, it will not be in the impulsive bear case shown above, which so much of the web's analysts have clung to week after week against all reason. And ultimately, even if we are moving lower, having the correct chart will eventually make all the difference for the future moves. Don't forget to join now before we close membership to new retail traders.